The oldest statue of the Blessed Virgin Mary in the United States to whom a constant public devotion has been maintained is a yard-high, wood-carved statue in the Cathedral of Santa Fe in New Mexico. She is called “Our Lady of the Rosary, La Conquistadora,” a notable title with much significance for our own times. Why is so little known of this image and the first shrine in the present United States to honor Mary, who was later to become the patroness of the entire nation? The answer perhaps lies in the fact that it was the English who became the almost exclusive recorders of the history of the United States. The history books in both the Catholic and secular schools of the 20th century begin the “story” with the Mayflower, the Pilgrims, and early New England settlements. We have, one might say, a Protestant version of the colonization of America. Until recently it was tantamount to historical heresy to claim that American history began, in depth, prior to 1607. It was only many years after my primary school history classes that I learned about the Catholic past of a colonial America in the South and Southwest. In New Mexico, for example, seven years before there was a Jamestown, the Spaniards had founded Santa Fe. Almost 75 years before the landing of the Mayflower, Fray Marcos de Niza first saw New Mexico and reported on the rich possibilities to be found there. All the early expeditions into the “New Kingdom of St. Francis,” which would later be New Mexico, included Franciscan missionaries, many of whom stayed behind to spread the Faith to the Indians and were martyred. I am sure the future will see the writing of an American Catholic history book that duly recognizes its Spanish and Catholic roots. And in that history, there will surely be a place for the story I will tell here. For, from the beginning of the Spanish presence on North American soil, the benevolent presence of Our Lady has been manifest. The majestic delicately featured statue was carved from willow in Spain sometime in the early 1600s and was given her first name, Our Lady of the Assumption. Originally, her wooden garment was painted crimson and covered with gold leaf in arabesque designs, the costume of a Moorish princess. When the statue made her journey to New Spain is not documented. What the records do show is that she arrived with a group of colonists in Santa Fe in 1625 in the care of a Franciscan missionary, Fray Alonso da Venevides. In the greatest pomp and ceremony he could muster in the primitive colony, he installed the statue in the Church of the Assumption, the first shrine in the U.S. to specifically honor Mary. Since a Confraternity of the Immaculate Conception already existed in Santa Fe, it was not long before the image organically assumed a second title: Our Lady of the Conception. The dogma of the Immaculate Conception had been promulgated for the Spanish kingdoms in 1617, and there was great enthusiasm for this invocation. Many of the Spanish Franciscans, including those in New Mexico, were wearing blue, rather than gray or brown, habits to commemorate the new honor shown Our Lady. All that was needed for the transformation was to add a silver crescent moon to the pedestal, and this was done. At the same time, the confraternity in Santa Fe determined to adopt the Spanish style of the time of dressing sacred images in real clothes. The body was pared of much of its form, movable arms attached, and Our Lady dressed in a rich silk dress, brocade mantle and jeweled crown. Inventories through history list Castilian mantillas, lavish damask and gold lamé gowns and mantles, and even tiny Parisian lace handkerchiefs and ruby earrings. 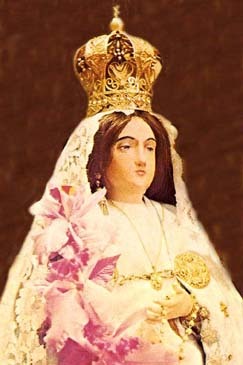 It was in these early days that the statue adopted a third title as well, Our Lady of the Rosary. The constant attacks from roving tribes and unconverted Pueblos caused the Spanish colonists to turn to their most trusted weapon in times of danger: the Rosary. Still fresh in the minds of Catholics was the memory of the victory of the Spanish fleet at Lepanto in 1571, when the Confraternity of the Rosary in Rome went through the streets praying for victory over the Saracens who threatened to overrun Christian Europe. Facing the growing boldness of the Indians, the first colonists of the Villa of Santa Fe turned with fervor to the Rosary. Our Lady had already sent a warning by means of 10-year-old girl, who had recovered instantaneously from a violent illness. In a vision, Our Lady had told her that the colony would suffer a chastisement and be destroyed because of the lack of reverence it had for her priests and the holy Religion. On August 12, 1680, the feast of St. Lawrence, the first Spanish martyr, the Indians joined together to make a well-planned attack. They killed 21 Padres on that day, burned the city and drove out the Spanish colonists. Because of the prayers and sincere effort to heed the warning of Our Lady, most of the colonists escaped with their lives. Miraculously, Our Lady of the Rosary was rescued from the blazing remains of the Church, and she joined the refugees in their flight to safety to what is today Juarez, Mexico, awaiting a champion who would risk a return. La Conquistadora waited twelve years for that champion. In 1691, Don Diego de Vargas was sent from Spain by the King to organize a campaign for the resettlement of Santa Fe. Like his noble conquistador forebears, Don Diego de Vargas was fearlessly intrepid and sincerely pious. The Catholic history of the New World is filled with the feats of such heroes, men forceful of character and mind who aspired to greatness of soul and deed. (2) Deeply devoted to the Virgin Mary, Don Diego de Vargas took on the difficult mission and vowed to return La Conquistadora to her rightful throne as Patroness and Protectress of the Kingdom and Villa of Santa Fe. In his remarkable re-entry without bloodshed into Santa Fe that made him famous throughout Old and New Spain, Don Diego led an army of the Reconquest under the banner of Our Lady. All along the trail, he undertook to meet with the Indian chieftains and won them over by the force of his personality and presence. Displaying Our Lady on the royal standard he carried, he told them that both Indians and Spaniards could now live in peace together under so tender a Mother who loved them all alike. The statue had taken on its final and most enduring title, devoutly bestowed by Our Lady’s champion Don Diego de Vargas. The group of close to 800 colonists encamped in a sheltered area outside the city, while Vargas led his troops into Santa Fe for the peaceful takeover. The tribe of Pueblo Indians, however, began to prevaricate. Supporting tribes joined them to assist them in their resistance. There was no recourse but battle for Don Diego and his vastly outnumbered Spaniards, who were short on both food and water and poorly sheltered in the bitter midwinter cold. The odds favored the Pueblos. In the civilian campsite outside the city, a makeshift shrine was erected for La Conquistadora, and fervent prayers for victory were made, Before the battle, Don Vargas knelt at the head of his companies of soldiers lined up in front of the improvised shrine and altar while all recited the Act of Contrition in a loud voice. The order for assault was given, the battle began, and the people continued praying the Rosary before the statue of their Queen. Throughout the morning and afternoon, the repeated Spanish attacks proved futile. Night fell and Santa Fe remained in Indian hands. Then, in an unexpected surprise attack before daybreak, the tide turned and the Spanish cavalry prevailed. The colonists reclaimed their “Villa of the Holy Faith,” with Don Vargas and the people crediting the outcome to the intercession of La Conquistadora. To acknowledge her benevolent generalship Don Vargas placed a small military officer’s baton in her right hand. Although Don Vargas had vowed to create a suitable “throne” for his Lady after her return, it was not until 13 years after his death in 1704 that the promise was realized. 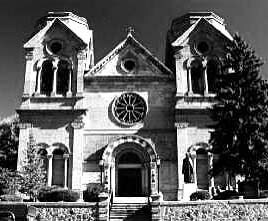 In 1717, the original adobe foundation of the first Church of the Assumption became the site for a larger church dedicated to St. Francis, which would later become the present day Cathedral of St. Francis. La Conquistadora left her makeshift chapel and was enthroned in the special Lady Chapel, where she can be venerated to this day. Another desire of Don Vargas was carried out eight years after his death by one of his Captains, Lt. Gov. Paez Hurtado, who influenced city officials to draft a proclamation for an annual celebration commemorating the peaceful 1692 resettlement. The 1712 proclamation established the first Fiesta de Santa Fe, to be celebrated by the whole city with a Mass, vespers, and a sermon. It was not long before the people began to take the statue out in procession from its Chapel in the Church of St. Francis to the site outside the city where the colonists had encamped before moving into Santa Fe. There under a ramada, or shrine of boughs, La Conquistadora was enthroned for nine days in June, with a Mass said every day during the novena. Another procession brought the image back home to the St. Francis Church until the following year. Today, enshrined in the Lady’s Chapel of the Cathedral of St. Francis, she is still cherished and feted at an annual festival by the people of the city and region. A procession still carries her to the old campsite, where today stands a chapel known as the Rosario, built in 1806 to replace the temporary shelter of cottonwood and juniper branches erected annually for her novena. With the passing of time, devotion to the Queen and Patroness of the Royal City of Santa Fe has never ceased. Small groups of pilgrims filter in an out to venerate the country’s oldest Madonna. In 1954 Our Lady of the Rosary: La Conquistadora was crowned by Cardinal Francis Spellman and in 1960 she received a Papal Coronation during ceremonies honoring the 350th anniversary of the founding of Santa Fe. Her golden crown is studded with precious stones, and her wardrobe has become rich and extensive, with new items constantly being presented by faithful devotees. These honors, so admirable and so appropriate, were nonetheless little known and celebrated by Catholics in America. One can only wonder what were the first designs of Our Lady for this country? She came first to U.S. soil as La Conquistadora, and through her intercession an important battle was won for Catholic New Spain. How would it have been had the country been truly conquered for Our Lord Jesus Christ and governed under the banners of the Queen of Heaven? Perhaps God will raise up champions devoted to Mary and faithful to the Holy Church still yet in the future who will seek to reinstall the Kingship of Christ through Mary. 1. It was the groundbreaking work on the “Spanish Borderlands” by Herbert Eugene Bolton in the 1920s and ’30s that opened the door to a broader approach to American history, one which was not simply Anglo-oriented or limited to the study of the 13 colonies to which 37 states were added in time. Bolton’s textbook The Colonization of North America 1492-1783 almost never saw light because it so upset the status quo history-telling of the United States: one-third of the whole is devoted to the Spanish period of settlements, missions, and colonization that took place before 1606, that is, before there were any permanent English settlements in America. Bolton and the Spanish Borderlands, ed. by John Francis Bannon (Norman: Un. of Oklahoma Press, 1968), p. 11. 2. The new history wants to discredit those individuals who have traditionally been identified as the heroes or “great men” of history, and to replace them by the “common man” or “ordinary people: It is not only elitist individuals who are disparaged and displaced, but also the great themes and events of history in which individuals necessarily figure preeminently. Included in this, naturally, are the epic theme of Discovery and the heroic Missionary movement. Gertrude Himmelfarb, “Of Heroes, Villains and Valets” in On Looking in the Abyss (New York: Alfred A Knoff, 1994). 3. Fray Angelico Chavez, La Conquistadora, The Autobiography of an Ancient Statue (Santa Fe: Sunstone Press, n.d.), p. 54.